Sugar. You and I have a long history. I was delivered in the hallway to the delivery room, screaming for dessert. It wasn't yet six in the morning. My mom offered her breast and I suckled and tasted sweet. It could have been the candy drawer she keeps to this day. I didn't 'lick it off the ground,' as my husband often says. Sugar is my fuel and my nemesis. Surrounded by a bunch of hippies, it doesn't get me far. But oozing Oatmeal Chocolate Chip Cookies on a Friday night, pulled from the oven just as my dear overworked roommate in New York walked in the door, made me instant friends. I believe it also secured a few boyfriends, perhaps a husband ! Those boys in New York aren't used to a chick who can hold her own on a trading floor AND bake a pie, crust included, from scratch. "Would you like that a la mode with this Bourbon Raisin Ice Cream I just threw together? "Now, ex-NYC husband in tow, I'm whipping up an awful lot of ice cream. 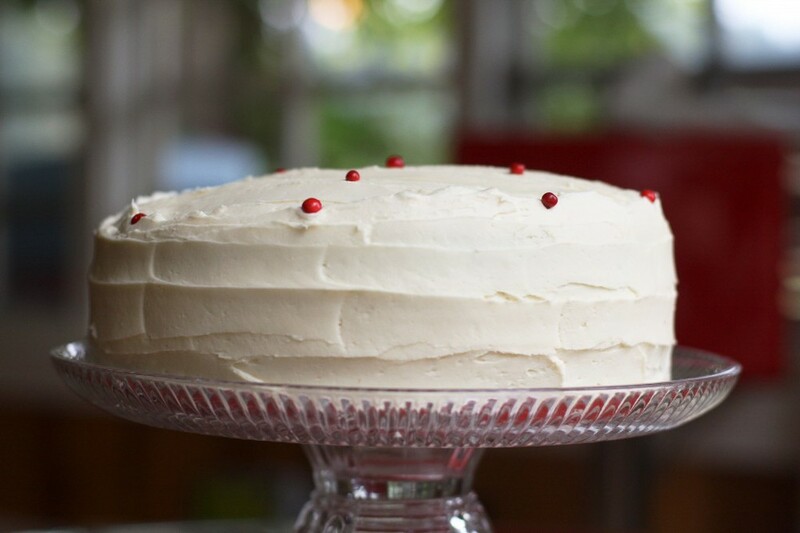 And cake (red velvet anyone?). And cookies. And candy. Any craving I have (and there are many), I simply attempt to make it. This is a very bad diet plan. Whereas before I would have popped out to secure an individual sized portion of said craving, now I am *forced* to make a batch. Usually a very large batch. Given I live on a small island, if I had the willpower to stay away from the oven, I'd be free from many sugary indulgences: we have no Chocolate Cupcakes with Vanilla Buttercream frosting like Magnolia Bakery, no Apple Tarts like Once Upon a Tart, no breakfast Praline Spread like at Le Pain Quotidian, no late night green tea Mochi ice cream as at the corner deli, no Lemongrass Mint Bon Bons like Kee's Chocolates, no Veniero's Pignoli cookies, no jumbo Chocolate Chip Walnut cookie as at Levain Bakery, and certainly no sinful Russian Napoleon Cake just off the Brighton Beach boardwalk. Rest assured I'm slowly working my way through knock-offs. Though the hippies and homesteaders may not find their way around a trading floor, they can certainly cook. I love a girl who's game to make Bacon Banana Cookies on a whim simply because someone challenged her -- that is so much more noble than whipping up a spreadsheet (though this one in particular can certainly do that as well). And I salute the hippy raised Mommies looking out for their kids with scratch cooked Chocolate Tofu Pie (with coconut graham cracker crust). It was beautiful; so good I asked for the recipe. I can't bring myself to make it. With so many luscious fats to choose from, why play with tofu? I implore myself daily to experiment with lower fat, more naturally sweet ingredients. I opted to make Coconut Macaroons the other day, justifying my baking plan by promising myself to drastically cut the sugar and opt for honey instead, and by no means do something as scandalous as dip them in chocolate. I did use honey, but only after adding nearly the amount of sugar called for. And then I dipped them in chocolate. Hubby's favorite candy is an Almond Joy - I couldn't resist (I have a husband to keep). And so I save au natural Coconut Macaroons for another time. Perhaps when Diabetes sets in (unlike Paula Dean, do not eat like this unless you exercise regularly). The true hippies would tell me to eat a fig. And I do, laced with mascarpone and drizzled with 10 year balsamic. Have you ever had a homemade Fig Newton made from figs laced with brandy? Eat a fig? Plain? Really? Perhaps wrapped in prosciutto. I appreciate a just picked strawberry as much as the next guy, but enlightened with a little homemade sponge cake and freshly whipped cream, it becomes something ethereal. I try to keep it simple; enjoy the small things. I can't tell you how excited I was to eat simply roasted Veronica Broccoli from my garden last week. But I've learned something about myself: it is not to be with sugar. Sugar can be SO much more. We are bound in a constant journey to make ginger candy better (stay tuned for your very own Ginger Taffy recipe), herald in childhood memories by hand crafting chocolate dipped Seafoam, and leave no pate brisee crust dry or unworthy of its sugar laced Marionberry filling for want of butter. Savory is simply my palate cleanser. The piece de resistance is always dessert. With that, my sweet, sugar sugar, I share with you, dessert. In a stand mixer fit with a paddle attachment, cream the butter and sugar until light and fluffy, about three minutes. Turn mixer to high and add eggs. Scrape down the bowl and beat until well incorporated. In a separate bowl mix together cocoa, water, vanilla and red food coloring to make a thick paste. Add to the batter, mixing thoroughly until completely combined. Keep scraping down sides and mixing until all the batter gets color. Pour batter evenly into two 9-inch cake rounds (buttered and floured). Bake for 19-22 minutes using a convection oven or 25-35 minutes using a standard oven. Check cake at earliest time. It is done when a toothpick inserted into the center comes out clean. *At this stage the cake rounds can be wrapped individually tightly in plastic wrap and frozen overnight (or longer). Freezing a cake prior to frosting helps seal in the moisture. Allow to partially thaw, while wrapped, before proceeding with frosting. You may add the middle frosting layer and crumb coat (light layer to seal in crumbs) while partially frozen. Layer on the final frost once the cake is completely defrosted. Allowing the cream cheese and butter ample time to soften is an important step to making sure the fats blend properly. Cream the cheese in stand mixer. Add butter and beat until well blended. Add brown sugar, salt, vanilla and blend. Add powdered sugar 2 cups at a time until desired sweetness is reached. Use milk or cream to thin, if needed. Beat for at least 5 minutes. I find the longer you beat, the better. I once read that was the secret to Magnolia's cupcakes in NYC - they just beat longer than you'd think possible. If the frosting has warmed up from the beating process, pop it in the refrigerator for a few minutes to chill before using.